Tim Costigan stands in his store, Mission Critter, as he prepares to close his doors after five years in the Mission. Photo by Mallory Newman. 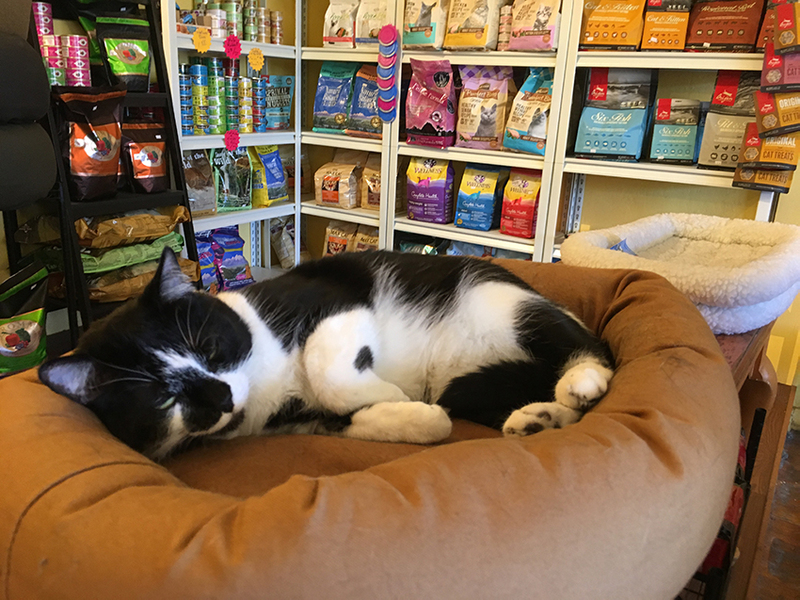 Mission Critter, which has helped the neighborhood hand pick the best pet foods and products for the Mission’s furry friends for the last five years, will close at the end of the month. That’s according to Tim Costigan, who owns and operates the store at 2959 Mission St. near 25th Street. Even winning the SF Weekly’s award for Best Pet Store of 2018 could not save Mission Critter from the onslaught of e-commerce. “It’s different now, because a good neighborhood pet shop used to be where you could get quality pet food versus the stuff you get at Safeway. Now, you can get super quality brands everywhere,” said Costigan. “People can buy everything on Chewy[.com], even though your local store will order it for you,” he said of the online retailer that is owned by PetSmart. It “can stock everything. I can’t,” he added, his four-year-old adopted cat, Louise, sleeping nearby. “Sentimentally, I love this. I love the people that come in with their dogs. It was just a balm to my soul after the nonprofit life, where I hit a wall,” he recalls. 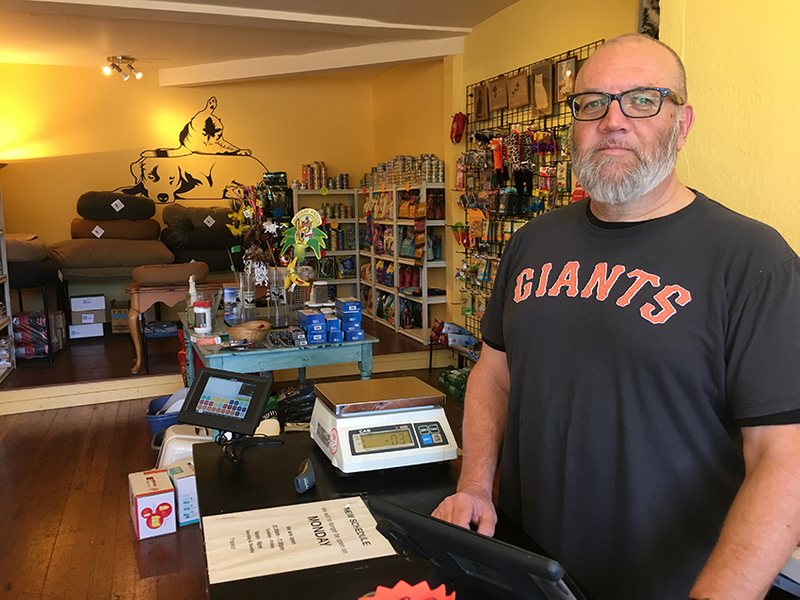 When he opened up shop in October 2013, he says there was no other pet shop in the Mission, although every other neighborhood had a local pet store. “In retrospect, maybe there’s a reason there wasn’t one in the Mission,” he said. Bernie’s, a pet and former grooming shop, operated on in the Mission from 1989 to 2006, when it partnered with SF Animal and Care Control. Customers at Mission Critter talked about the relationships that they — and their pets — had developed with Costigan. When Alexa Trevino’s shih tzu Gorda sees the pet store owner on the street, she “follows him because he [Costigan] keeps treats in his pocket.” Trevino said she’s not an online shopper, because she’s also a small business owner who runs Artillery AG down the street, and she knows the impact of shopping locally. “Hahaha! Okay great!” said Beery. Louise, Costigan’s adopted cat, is said to be the real boss of pet store Mission Critter. Photo by Mallory Newman. Costigan spends his days patiently answering such questions. When asked about his favorite memory at the shop, Costigan took a long pause. He stared intently at his hand, contemplated deeply for a moment as if wrestling internally. It’s clear that shutting down a shop you poured your heart into is hard. “You build a relationship with the people and their pets,” he continued. She appreciated the time Costigan brought in cat behaviorist Daniel “DQ” Quagliozzi, who shared with the crowd that most cat issues come down to dissatisfaction with the litter box. Yes, Mission Critter will be sorely missed. It is all you said in the article. The only thing you missed, although it’s suggested by the photo, Tim is a die-hard Giants’ fan, as optimistic as the fog. Good luck Tim. Have fun. And hey, if Hunter Pence can get push across two runs in the bottom of the 11th, who knows what can happen? Retail stores are at risk everywhere; sadly, e-commerce is our future. The convenience of having products delivered to your door is just too seductive. “Pushed out”? No. Get a grip, headline writer. You know what I miss? Ice delivery. Nowadays most people have electronic freezers, and it’s driven up the cost of delivered ice so high that now I need to use Postmates to have ice delivered to my house. Just to keep my groceries fresh. Why must everyone gravitate towards new technology. If we could just all stick with what’s worked in the past, think of all the ice delivery jobs we’d save.